Nothing says the holidays like a fruitcake! 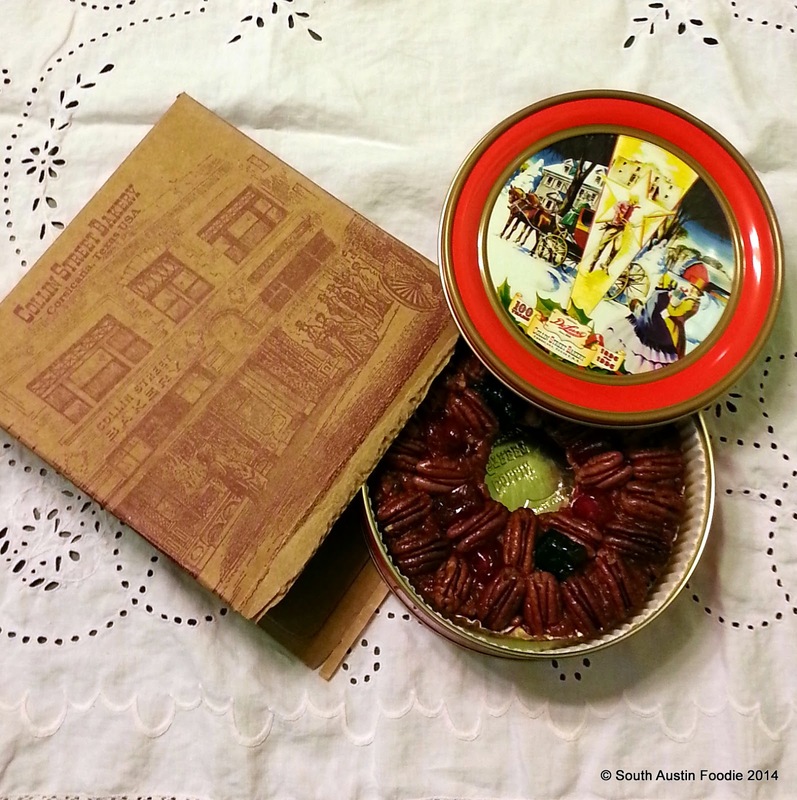 And we're talking REAL Texas fruitcake from Collin Street Bakery in Corsicana, made with Texas pecans, local honey (from cotton blossoms), and in production for over 115 years. Pictured here is the DeLuxe Fruitcake, which weighs in just under two pounds, for $27.95 (larger sizes available)! The original recipe came from Wiesbaden, Germany and the family of the bakery's founder. Fruitcakes originated as a method to preserve fruits and nuts over the cold months. 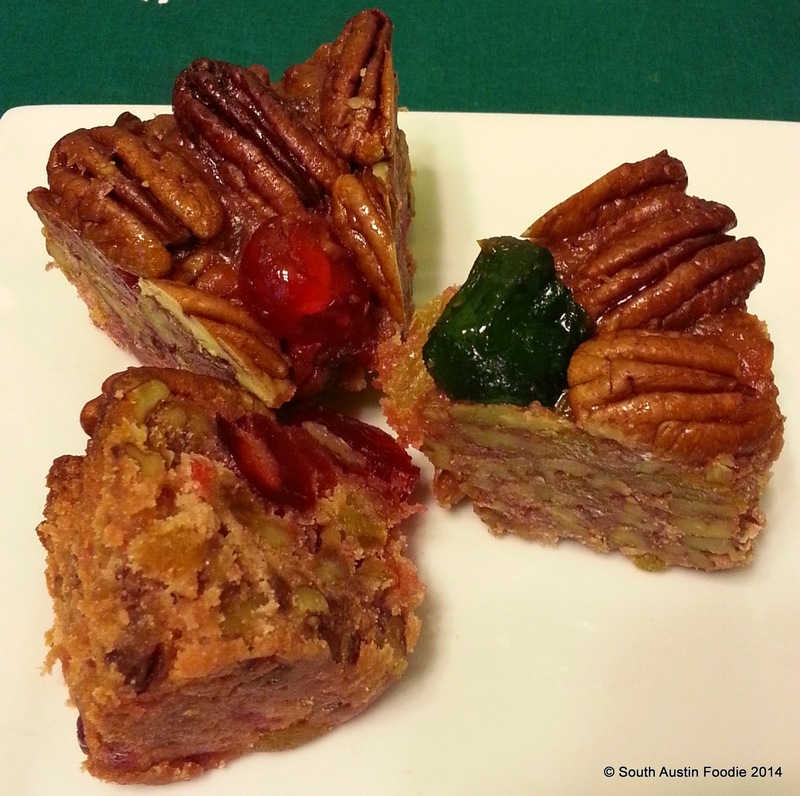 Collin Street's fruitcakes continue to be about 80% fruits and nuts. Do you see how big these pecans are?! They're huge, and they still have crunch to them! 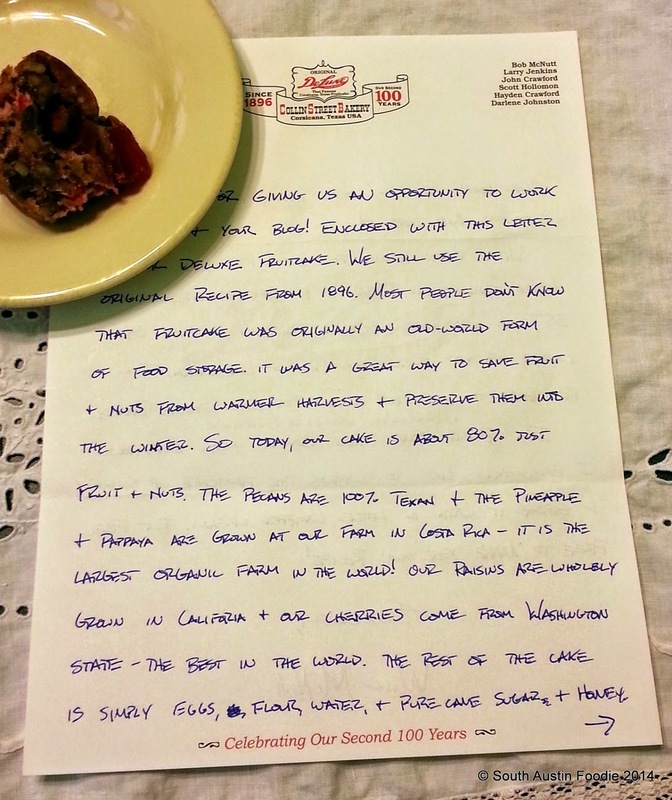 I learned (and loved this hand-written letter from one of the owners, Will McNutt, and they are still family-owned) that Collin Street owns an organic farm in Costa Rica, where they grow pineapples and papaya. And Will shares that he loves his fruitcake warmed up with a touch of whipped cream. Their website also has suggestions on how to "booze" up your fruitcake! But even in it's natural state, you can't beat it! This is not Aunt Bertha's fruitcake, I guarantee you. Check out their website to order a fruitcake for the holidays! Order by December 19th or risk the rath of extra postal fees. 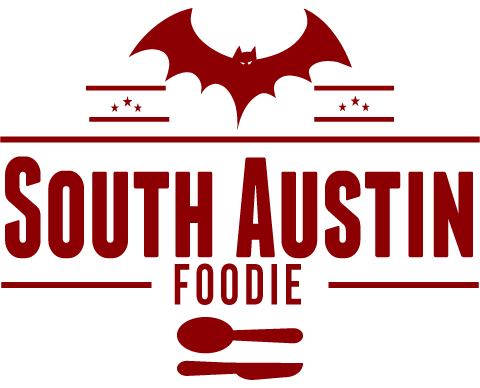 You'll also discover a trove of other sweet treasures on their site, such as pecan pies, cakes, cheesecakes and much more. 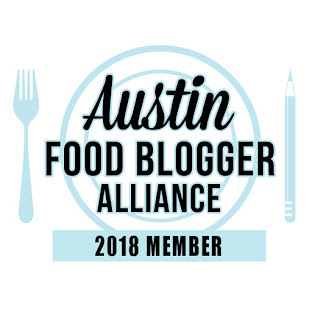 Spread the love of Texas products this holiday season! Disclosure: I was sent a complimentary fruitcake, in exchange for a blog post; all opinions are my own.